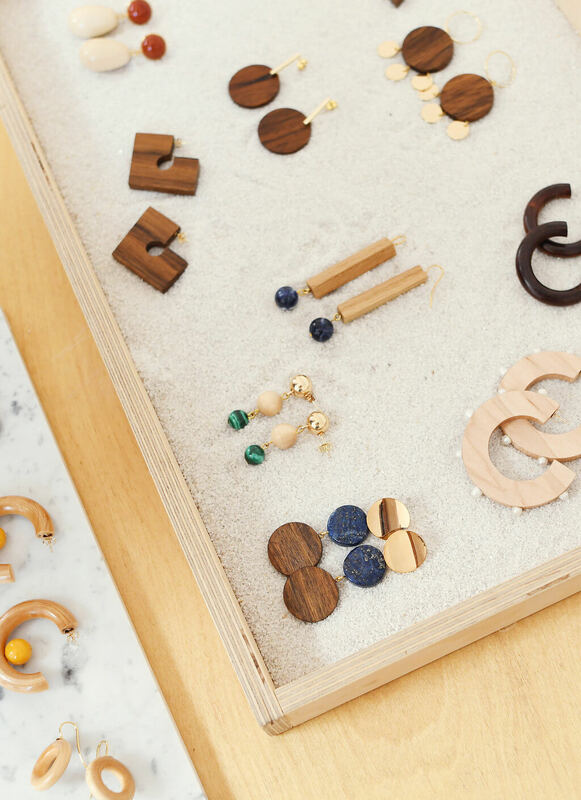 Sophie Monet was destined to design jewelry collections. While growing up in Los Angeles, she always had an interest in creating unique items. 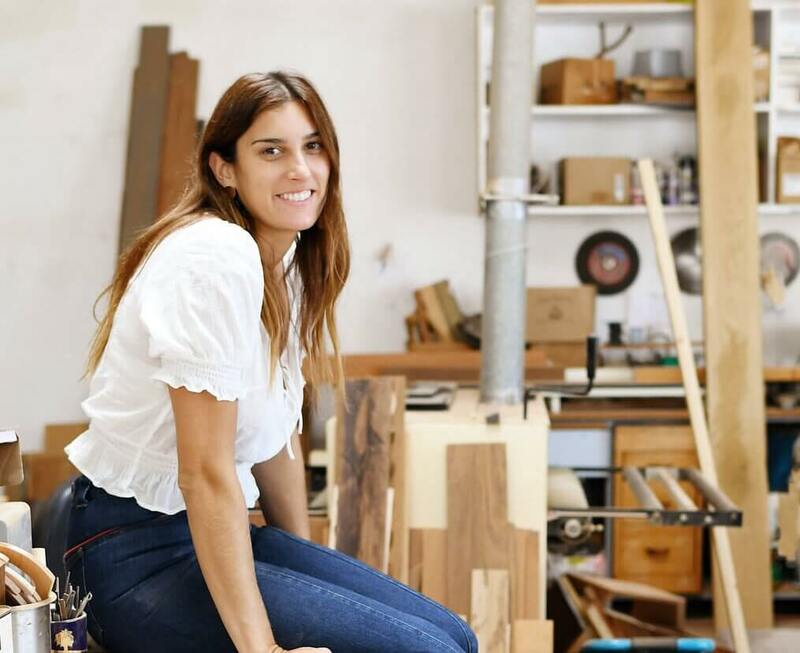 When she’s not in her wood-shop working alongside her artist father, she is exploring outside for new inspiration. 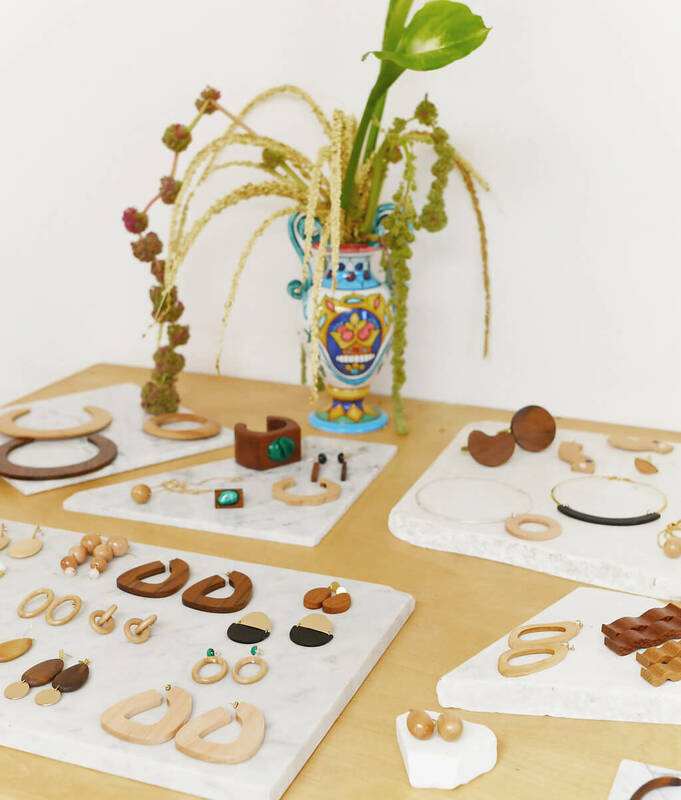 We had the pleasure of visiting her in Venice Beach and talking all about her creative vision, travel, and go-to accessories. Melissa: Did you always want to design jewelry? 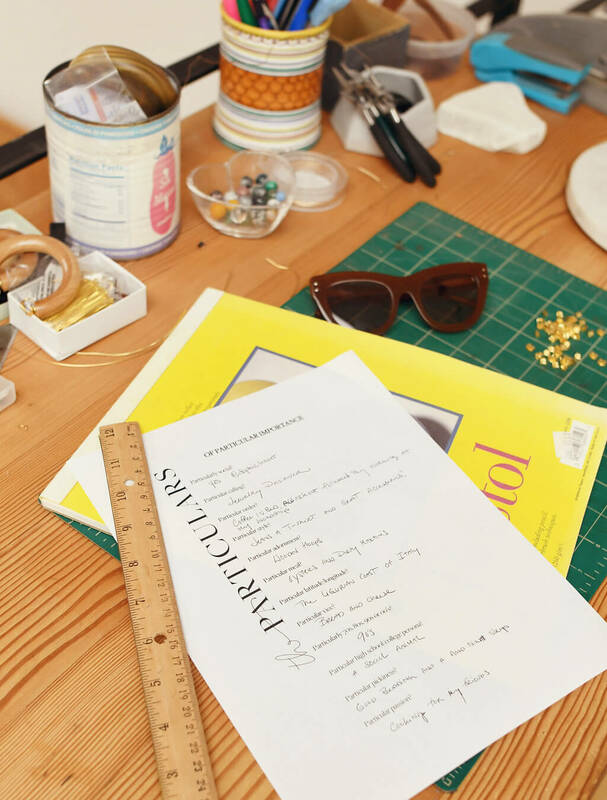 How did you decide to pursue jewellery design in school? Sophie: I always liked creating things and using my hands. I would make jewelry when I was a kid and go to flea markets. When I was 12 or 14, my girlfriend and I would go to the Santa Monica flea market and just find vintage jewelry and clothes. I think that’s what really sparked my interest in fashion. Treasure hunting for things that were unique and different. Also growing up around art made me really want to combine fashion and art to create a line. M: You make such beautiful, original pieces, where do you dream up your creations? S: It flows. I am always designing new pieces and coming up with ideas. I’ll find shapes in wood and shells on the beach and recreate a shape that I see. I like to sketch a lot and cut pieces out of paper first. Then I’ll trace it in the wood and cut out the piece. Just fooling around and trying different methods and thinking about if it could be cute as an earring or a necklace. Mostly trial and error. I think my designs are always changing. I’ll find a shape I like and stick with it and change it into different accessories. M: Do you have any travel places you go to for inspiration? S: I think travelling is one of my main sources of inspiration. I think that’s when you’re most recharged and refreshed. Everything feels good, tastes good, looks good, and that’s when I’m the most creative. I want to go to Japan so bad. That’s on the top of my list. I can’t wait to go there. I love Italy and that’s where I’m going next. I’m going to Sicily in a couple weeks with my family. I am so excited. The water, the rock formations, the food; it’s going to be a big source of inspiration. M: Your dad seems to be a very large inspiration in your company, what inspired your dad to start his work? S: He’s been a mentor throughout my career and he inspires me so much. His use of scale, dimension, and changing the way people look at shapes has been a huge inspiration for me with everything I do. He has a new perspective of looking at things. He’s so knowledgeable in the techniques and the materials, so everything I really know about using wood and making jewelry comes from him. He makes things on such a huge scale, and I make things on such a teeny tiny scale, so it’s a nice contrast. I have my own design aesthetic, so it’s nice to have a combination of the two. M: Is there anything your dad has taught you in business that has really stuck out? Like a piece of advice or did you ever have a challenging time and went to your dad? S: He helps me scale my business. I’ve gotten a few big orders and I freak out. He just immediately calms me down. He tells me, “don’t worry, we are going to figure this out, we have our family and that’s all you need.” As long as he’s there, that’s all I need. Working so close with my family and where I grew up is the best part of doing what I do. He’s very encouraging. My sister is too. She has such a business perspective on things, so she helps me make decisions. When I need to ask, she’s right there. M: How many collections do you release per year? S: It’s not that specific. I operate on a see-now buy-now method. I feel like jewelry is so flexible that I don’t have to be so restricted to a fashion calendar, which I love. I think that’s also what’s great about LA. The environment is more laid back. People have an appreciation for handmade goods and I think that’s how I work. M: Has there been one piece that blew your expectations in terms of sales? S: Totally. The Bell Hoops that are just these big, modern 70’s earrings. They are so unique that I’ve evolved them over time. I’ve changed different ways of wearing them and made them in different woods. There is a new pair I just made that are a variation of the same shape. The design possibilities are endless, so that’s why I’m constantly designing and making things. Eventually, once I have a lot of stuff, I edit the collection and make a look book to really tell the story of what I was inspired by. M: Do you sell only on your website? Or do you sell to other places too? S: I sell to a lot of other places, but primarily on my website. M: Where do you produce everything? S: I produce everything here, in the wood-shop downstairs. I have a few people that help me once in a while. My dad is a big help too. When he’s designing stuff, he leaves behind a lot of pieces of wood, so that’s my way of repurposing scrap pieces of wood. I like to incorporate it into my design and it introduces me to new woods. Part of the challenge that I like is designing around 10 pieces of wood that are all constrained to these proportions. It’s a fun challenge. M: You obviously love to accessorize, what is your go to outfit to show off your pieces. S: I am totally a denim jean and t-shirt girl. With a good pair of shoes or a great pair of sneakers. M: Being in such a creative field, your day to day must change quite a bit. What does your “typical” day look like? S: It varies because I can make my own schedule. It’s just me here. I don’t have any employees. A typical day is waking up, having a coffee in bed, going to work out, and then coming here. I must be focused on managing my time because I’m wearing so many different hats. M: What do you do to unwind? Are there any things you just do for yourself? S: It’s so nice working so close to the beach. I grew up close to the beach. I’m so lucky to have that three blocks away. I’ll meet my friends at the beach and watch the sunset or grab a glass of wine. I just like to be outside. I find ways to unwind that way. M: If we were to raid your closet, what kind of accessory would we find the most of? S: Sunglasses. I love sunglasses. I think I have 20 pairs of Garret Leight sunglasses. Any vacation I go on, I need a new pair! M: What’s one accessory you never leave home without? S: A Clare V. handbag. I have a lot of those too. M: What’s your favourite trend happening right now? S: I love the hoop trend. I wear hoops almost every day. I think they are transitional from day to night. You can wear them with jeans, or a dress, anything. Hoops in any form, but mainly wood. Haha! M: Do you have any advice for anyone starting a jewelry line? S: Be true to yourself. Experiment as much as possible with different materials. Go for it, don’t hold back. Take your time. Starting your own business shouldn’t be a rush. I think you should really develop your own style and voice.